As you are reading this, Safety In Sound will be donning my wellies and heading off to Leeds Festival! While we won’t be camping out this year, we will be taking in all the sights, sounds and smells (mainly from the portaloos) of Friday – expect to see us down the front for the hilariously good main run of The Maccabees, Jamie T and Kendrick Lamar. Despite only popping along for the day in conjunction with Relentless (who were kind enough to provide our pass – kudos! ), we’ll be making sure we’re at the NME/Radio 1 tent early, in time for that now-legendary secret slot. I’m not a betting girl, but with cryptic clues about ‘wild horses’ in place, I certainly wouldn’t be surprised by an appearance from Oxford’s very own, Foals. With their latest record out today (insert ‘holla hands’ emoji), it would be the perfect opportunity to introduce the world to ‘What Went Down’ in glorious fashion – I’ve always thought Foals to be at their best when they’ve live. If you’re not lucky enough to be heading to Reading or Leeds this year, don’t despair. Foals will be taking part in a brand new TV show on MTV tonight: Relentless Ultra Present Soundchain. Offering up the chance to get behind the music, they’ll be playing live tracks and chatting to presenter Nick Grimshaw about their path to success, their musical upbringings and the various incarnations that led them to where they are today… Car Bomb Dating, anyone? Relentless were kind enough to provide me some transcript for the show, so make sure you tune in to MTV Music at 11pm for the likes of this…. Nick Grimshaw: When was it you guys actually met for the first time? Nick Grimshaw: Called? We need it for the documentary! Yannis Phillipakis: Car Bomb Dating. Nick Grimshaw: And guys that’s all we’ve got time for! Nick Grimshaw: Car Bomb Dating?! 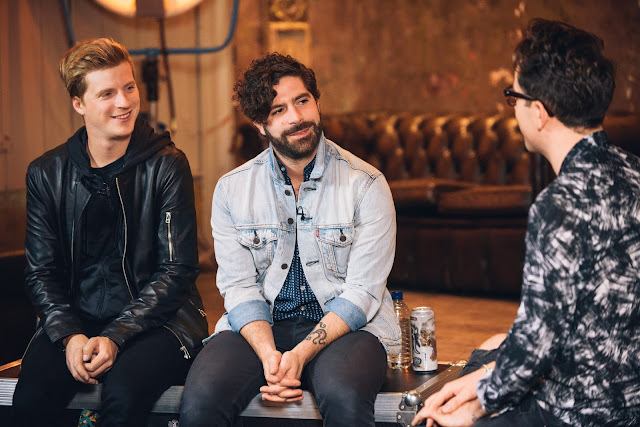 Yannis: That band was called The Edmund Fitzgerald, and it was like really really proggy, geeky, really complicated guitar stuff… Deeply unsexy. Nick: So that was like a conscious thought? Nick: What was the biggest sacrifice that you have had to make for the sake of Foals? Yannis: Well I think there’s probably a few things. One thing is definitely an element of sanity goes out the window if you’re making music for as long as we’ve been doing it. Touring you definitely sacrifice a large portion of your liver and probably your general health. And also you do sacrifice I think to some extent personal relationships. Nick: And you’re at the NME awards… Waheyyy! Yannis: And we’re still pratting around, having shots on a Monday night. Not complaining.